방송 서비스 통신 시스템에서 외부 디코더의 이용을 위한 방법 및 시스템을 설명한다. In the broadcast services communication systems will be described a method and system for the use of an external decoder. 송신될 정보가 복수의 송신 버퍼의 시스터매틱 부분에 제공되고 송신 버퍼에 통신가능하게 연결된 외부 디코더에 의해 인코딩된다. Information to be transmitted is provided on sister schematic section of a plurality of transmit buffers and encoded by an outer decoder communicatively coupled to the transmission buffer. 결과적인 리던던트 비트가 각 송신 버퍼의 패리티 부분에 제공된다. The resulting redundant bits are provided to a parity section of each of the transmission buffer. 송신 버퍼의 컨텐츠가 멀티플렉싱되고 내부 디코더에 의해 인코딩되어 리던던시를 추가함으로써 보호를 개선시킨다. It is the contents of the transmission buffer and multiplexing the encoding by the inner decoder by adding the redundancy to improve the protection. 수신국은 인버스 프로세스에 의해 송신된 정보를 복구한다. The receiving station to recover the information transmitted by the inverse process. 디코딩 복잡도가 송신 버퍼의 시스터매틱 부분의 사이즈에 의존하기 때문에, 시스터매틱 부분 사이즈와 송신 버퍼의 수 사이의 합리적인 절충안은 감소된 디코딩 복잡도를 생성한다. Since the decoding complexity is depending on the size of the sister schematic section of a transmission buffer, a reasonable compromise between sister schematic number of parts and size of the transmit buffer and generates a reduced decoding complexity. 인코더, 디코더, 시스터매틱 부분, 송신 버퍼. An encoder, a decoder, a sister schematic section, the transmission buffer. 본 발명은 통신 시스템에 관한 것이다. The present invention relates to a communication system. 특히, 본 발명은 통신 시스템에서 디코딩 복잡도를 감소시키는 시스템 및 방법에 관한 것이다. In particular, the invention relates to a system and method for reducing the decoding complexity in a communication system. 통신 시스템은 발신국으로부터 물리적으로 별개인 수신국으로 정보 신호를 송신할 수 있도록 개발되었다. Communication systems have been developed to transmit information signals to separate from the receiving station physically from the origination station. 통신 채널을 통해 발신국으로부터 정보 신호를 송신하는데 있어서, 먼저 정보 신호는 통신 채널을 통한 효과적인 송신을 위해 알맞은 형태로 변환된다. Method for transmitting an information signal from the origination station over a communication channel, the information signal is first converted into a form suitable for efficient transmission over the communication channel. 정보 신호의 변환, 또는 변조는 정보 신호에 따라 반송파의 파라미터를 변경하는 것을 수반함으로써 최종 변조된 반송파의 스펙트럼은 통신 채널 대역폭 내로 한정된다. Conversion, or modulation, of the information signal spectrum of the modulated carrier by a final involves varying a parameter of a carrier wave in accordance with the information signal is confined within the communication channel bandwidth. 수신국에서, 원래 정보 신호는 통신 채널을 통해 수신된 변조 반송파로부터 복제된다. At the destination station the original information signal is replicated from the modulated carrier wave received over the communication channel. 일반적으로, 이러한 복제는 발신국이 사용하는 변조 프로세스의 역 (inverse) 을 사용함으로써 달성된다. In general, such replication is accomplished by using the reverse (inverse) of the modulation process of the source station in use. 또한, 변조는 공통 통신 채널을 통하는 여러 신호의 다중-액세스, 즉, 동시 송/수신을 용이하게 한다. In addition, the modulation multi-number of signals passing through the common communication channel to facilitate access, i.e., simultaneous transmission / reception. 다중-액세스 통신 시스템은 공통 통신 채널로의 연속적인 액세스 보다는 비교적 짧은 지속기간의 단속적인 서비스를 요청하는 복수의 가입자 유닛을 포함한다. Multiple-access communication system comprises a plurality of subscriber units requesting the intermittent service of relatively short duration rather than continuous access to the common communication channel. 시간 분할 다중-액세스 (TDMA), 주파수 분할 다중-액세스 (FDMA), 및 진폭 변조 다중-액세스 (AM) 와 같은 여러 다중-액세스 기술이 당업계에 공지되어 있다. Several multiple-access, such as (AM) - - a time division multiple-access (TDMA), frequency division multiple-access (FDMA), and amplitude modulation multiple-access techniques are known in the art. 또 다른 형태의 다중-액세스 기술은 이하, IS-95 표준이라 칭하는 "TIA/EIA/IS-95 Mobile Station-Base Station Compatibility Standard for Dual-Mode Wide-Band Spread Spectrum Cellular System"에 따르는 코드 분할 다중-액세스 (CDMA) 확산 스펙트럼 시스템이다. Another type of a multiple-access technique is less, IS-95 standard as referred to "TIA / EIA / IS-95 Mobile Station-Base Station Compatibility Standard for Dual-Mode Wide-Band Spread Spectrum Cellular System" code division multiple according to the - access (CDMA) is a spread spectrum system. 다중-액세스 통신 시스템에서 CDMA 기술의 사용이, 본 발명의 양수인에게 모두 양도된, "SPREAD SPECTRUM MULTIPLE-ACCESS COMMUNICATION SYSTEM USING SATELLITE OR TERRESTRIAL REPEATERS"라는 명칭의 미국 특허 제 4,901,307 호 및 "SYSTEM AND METHOD FOR GENERATING VAVEFORMS IN A CDMA CELLULAR TELEPHONE SYSTEM"이라는 명칭의 미국 특허 제 5,103,459 호에 개시되어 있다. Multi-use of CDMA techniques in the access communication system, the transfer of all to the assignee of the present invention, "SPREAD SPECTRUM MULTIPLE-ACCESS COMMUNICATION SYSTEM USING SATELLITE OR TERRESTRIAL REPEATERS" entitled U.S. Patent 4,901,307 No. and "SYSTEM AND METHOD FOR GENERATING VAVEFORMS iN a CDMA CELLULAR TELEPHONE SYSTEM "is disclosed in U.S. Patent No. 5,103,459 in the name of Lake. 다중-액세스 통신 시스템은 무선 또는 유선일 수도 있고 음성 및/또는 데이터를 반송할 수도 있다. Multiple-access communication system may be a wireless or wire may carry voice and / or data. 음성 및 데이터 모두를 반송하는 통신 시스템의 예로는, 통신 채널을 통해 음성 및 데이터 송신을 특정하는 IS-95 표준에 따르는 시스템이 있다. An example of a communication system carrying both voice and data, over a communication channel there is a system in accordance with the IS-95 standard, which specifies a voice and data transmission. 고정 사이즈의 코드 채널 프레임에서 데이터를 송신하는 방법은 본 발명의 양수인에게 양도된, "METHOD AND APPARATUS FOR THE FORMATTING OF DATA FOR TRANSMISSION"이라는 명칭의 미국 특허 제 5,504,773 호에 상세히 설명되어 있다. A method for transmitting data in code channel frames of fixed size is described in detail in U.S. Patent No. 5,504,773 in the name of the assigned to the assignee of the present invention, "METHOD AND APPARATUS FOR THE FORMATTING OF DATA FOR TRANSMISSION". IS-95 표준에 따르면, 데이터 또는 음성은 14.4Kbps 정도로 높은 데이터 레이트를 갖는 20 밀리초 폭인 코드 채널 프레임으로 파티션된다. According to the IS-95 standard, the data or voice is partitioned into code channel frames of 20 ms width with a high data rate so 14.4Kbps. 음성 및 데이터 모두를 반송하는 통신 시스템의 또 다른 예는, 문헌 3G TS 25.211, 3G TS 25.212, 3G TS 25.213, 및 3G TS 25.214 (W-CDMA 표준), 또는 "cdma2000 확산 스펙트럼 시스템용 TR-45.5 물리층 표준" (IS-2000 표준) 을 포함하는 문헌의 세트에 포함된, "3세대 파트너쉽 프로젝트" (3GPP) 에 따르는 통신 시스템이다. Another example of a communication system carrying both voice and data, document 3G TS 25.211, 3G TS 25.212, 3G TS 25.213, and 3G TS 25.214 (W-CDMA standard), or "cdma2000 Spread Spectrum Systems TR-45.5 Physical Layer for standard is a communication system in accordance with the "(iS-2000 standard), the included in the set of documents containing" 3rd generation partnership project "(3GPP). 데이터 전용 통신 시스템의 예로는, 이하 IS-856 표준이라 칭하는 TIA/EIA/IS-856 산업 표준을 따르는 하이 데이터 레이트 (HDR) 통신 시스템이 있다. An example of a data only communication system, there is less than the IS-856 standard as a high data rate (HDR) communication system in accordance with the TIA / EIA / IS-856 industry standard referred to. 이러한 HDR 시스템은 본 발명의 양수인에게 양도된, 1997년 11월 3일 출원한 "METHOD AND APPARATUS FOR HIGH RATE PACKET DATA TRANSMISSION"이라는 명칭의 공동-계류중인 출원 번호 08/963,386 호에 개시된 통신 시스템에 기초한다. This HDR system is the cavity of the title of one assigned to the assignee of the present invention, filed on November 3, 1997, "METHOD AND APPARATUS FOR HIGH RATE PACKET DATA TRANSMISSION" - based on a communication system disclosed in Application No. 08/963 386 No. pendency do. HDR 통신 시스템은 액세스 포인트 (AP) 가 데이터를 가입자국 (액세스 단말기 (AT)) 으로 전송할 수도 있는 38.4 Kbps로부터 2.4 Mbps까지의 범위인 데이터 레이트의 세트를 정의한다. HDR communication system defines the access point (AP) is set in the data rate range of up to 2.4 Mbps from 38.4 Kbps, which may be transmitted to the self station (access terminal (AT)) to join the data. AP가 기지국과 유사하기 때문에, 셀 및 섹터에 관한 전문용어는 음성 시스템에 관한 것과 동일하다. Because the AP is similar to the base station, the terminology related to cells and sectors is the same as that on the audio system. 다중-액세스 통신 시스템에서, 사용자 사이의 통신은 하나 이상의 기지국을 통해 실행된다. Multiple-access communication system, communications between users are performed through one or more base stations. 제 1 가입자국에 대한 제 1 사용자는 기지국으로 리버스 링크를 통해 데이터를 송신함으로써 제 2 가입자국에 대한 제 2 사용자와 통신한다. A first user on one subscriber station communicates with a second user on a second subscriber station by transmitting data on a reverse link to a base station. 기지국은 데이터를 수신하고 또 다른 기지국으로 데이터를 라우트할 수 있다. The base station may receive the data and route the data to another base station. 데이터는 동일한 기지국, 또는 다른 기지국의 포워드 링크를 통해 제 2 가입자국으로 송신된다. Data is transmitted to the second subscriber station via the same base station, or forward link of another base station. 포워드 링크는 기지국으로부터 가입자국으로의 송신을 칭하고, 리버스 링크는 가입자국으로부터 기지국으로의 송신을 칭한다. Forward link refers to transmission from the base station to the subscriber station, reverse link refers to a transmission from a subscriber station to a base station. 유사하게, 통신은 제 1 가입자국에 대한 제 1 사용자와 지상통신국에 대한 제 2 사용자 사이에서 실행될 수 있다. Likewise, the communication can be performed between the second user to the first user and the ground station to the local station first subscriber. 기지국은 리버스 링크를 통해 사용자로부터 데이터를 수신하고, 공중 교환 전화 네트워크 (PSTN) 를 통해 제 2 사용자에게 데이터를 라우트한다. The base station over the reverse link to receive data from the user, and routes the data to the second user through the public switched telephone network (PSTN). 많은 통신 시스템, 예를 들어, IS-95, W-CDMA, IS-2000에서, 포워드 링크 및 리버스 링크에는 개별 주파수가 할당된다. Many communication systems, for example, in IS-95, W-CDMA, IS-2000, the forward link and reverse link, the individual frequency is assigned. 통신 시스템의 단말기 사이에서 교환되는 정보 신호는 종종 복수의 패킷으로 구성된다. An information signal exchanged between the terminal of the communication system is often composed of a plurality of packets. 이를 설명하기 위해, 패킷은 특정한 포맷으로 배열된 데이터 (페이로드) 및 제어 엘리먼트를 포함하는 바이트의 그룹이다. To illustrate this, a packet is a group of bytes, including data (payload) and control elements arranged in a specific format. 제어 엘리먼트는 예를 들어, 프리앰블 및 품질 매트릭스를 포함한다. Control elements include, for example, a preamble and a quality matrix. 품질 매트릭스는 예를 들어, 순환 리던던시 검사 (CRC), 패리티 비트(들), 및 당업자에 공지되어 있는 다른 형태의 매트릭스를 포함한다. Quality metrics include, for example, cyclic redundancy check (CRC), parity bit (s), and is known to those skilled in the art that other types of matrix. 그 후, 패킷은 통신 채널 구조에 따라 프레임에 적합하도록 포맷된다. Then, the packets are formatted to fit the frame in accordance with a communication channel structure. 발신 단말기와 수신 단말기 사이를 이동하는 적절하게 변조된 프레임은 통신 채널의 특성, 예를 들어, 신호 대 잡음비, 페이딩, 시간 변동, 및 다른 특성에 의해 영향을 받는다. A suitably modulated frame to move between the calling terminal and the called terminal is influenced by the characteristics of the communication channel, e.g., signal-to-noise ratio, fading, time fluctuation, and other characteristics. 이러한 특성들은 서로 다른 통신 채널에서 서로 다르게 변조된 신호에 영향을 미친다. These characteristics affect the modulated signal differently in different communication channels. 그 결과, 무선 통신 채널을 통한 변조된 신호의 송신은 유선 통신 채널, 예를 들어, 동축 케이블 또는 광케이블을 통한 변조된 신호의 송신과는 다른 고려사항을 요청한다. As a result, transmission of a modulated signal over a wireless communication channel is requesting information wired communication channels, for example, it is transmitted and other considerations of a modulated signal through a coaxial cable or optical cable. 특정한 통신 채널에 적합한 변조를 선택하는 것 이외에도, 정보 신호를 보호하는 다른 방법이 연구되었다. In addition to selecting a modulation appropriate for a particular communication channel, other methods for protecting the information signal have been investigated. 이러한 방법은, 예를 들어, 인코딩, 심볼 반복, 인터리빙, 및 당업자에게 공지되어 있는 다른 방법을 포함한다. Such methods include, for example, encoding, symbol repetition, interleaving, and are known to those skilled in the art other ways. 그러나, 이들 방법은 오버헤드를 증가시킨다. However, these methods increase overhead. 따라서, 정보신호 전달의 신뢰도와 오버헤드의 양 사이의 엔지니어링 절충이 이루어져야 한다. Thus, the engineering trade-off must be made between the amount of reliability and the overhead of the information transmission signal. 전술한 정보 신호의 보호를 사용하더라도, 통신 채널의 상태는 수신국이 어떠한 패킷을 디코딩 (이레이저) 할 수 없는 포인트까지 저하할 수 있다. Even with the protection of the above-mentioned information signal, the state of the communication channel can degrade to the point that can not be decoded (the laser) for any packet receiving station. 수신 단말기로부터 발신 단말기로의 피드백 통신을 허용하는 데이터 전용 통신 시스템에서, 하나의 큐우 (cure)가 수신국에 의해 이루어지는 자동 재송신 요청 (ARQ) 을 사용하여 디코딩되지 않는 페킷을 발신국으로 재송신한다. In data-only communications systems allowing for feedback communication to the calling terminal from the called terminal, and retransmits the non-decoded Packet using one kyuwoo (cure) the automatic retransmission request (ARQ) made by the destination station to the origination station. 그러나, 어떤 조건하에서, ARQ는 통신 시스템을 오버로드할 수도 있다. However, under certain conditions, ARQ may overload the communication system. 또한, 방송 통신 시스템에 관하여 설명한 바와 같이, 가입자는 기지국으로 역으로 통신하지 못한다. Further, as described with respect to a broadcast communication system, the subscriber station can not communicate with the base station. 그 결과, 정보 보호의 다른 수단이 바람직하다. As a result, other means of information protection are desirable. 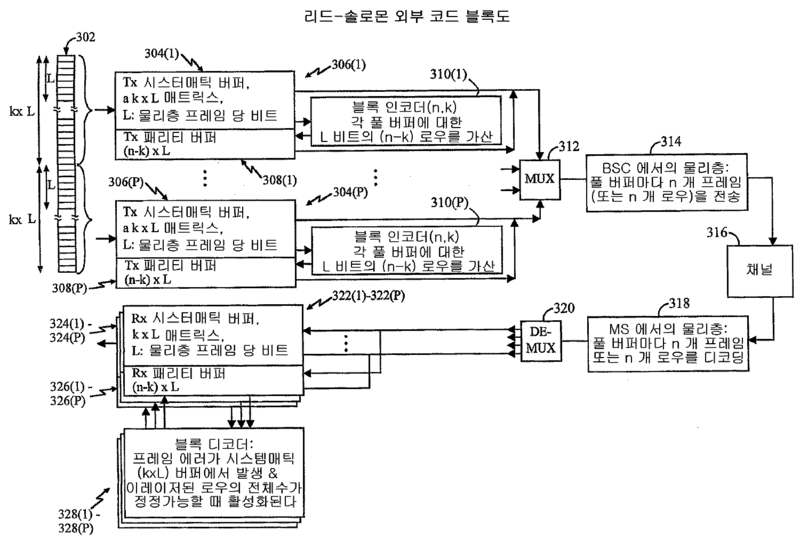 본 발명의 양수인에게 양도되고, 2001년 8월 20일 출원한, "METHOD AND SYSTEM FOR UTILIZATION OF AN OUTER DECODER IN A BROADCAST SERVICES COMMUNICATION SYSTEM"이라는 명칭의 공동-계류중인 출원 제 09/933,912 호는 방송 시스템에서 외부 디코더의 사용을 상세히 논의하고 있다. And assigned to the assignee of the present invention, a filed August 20, 2001, "METHOD AND SYSTEM FOR UTILIZATION OF AN OUTER DECODER IN A BROADCAST SERVICES COMMUNICATION SYSTEM" cavity of the called name-pending Application No. 09/933 912 discloses a broadcast system and discussed in detail with the use of an external decoder. 공동-계류중인 출원 제 09/933,912 호에 설명하는 바와 같이, 먼저, 송신될 정보의 비트 스트림이 외부 디코더에 의해 인코딩된 후, 인코딩된 스트림이 내부 인코더에 의해 인코딩된다. Co-pending, as described in Application No. 09 / No. 933 912, is, first, a bit stream of encoded information to be transmitted by the external decoder, the encoded stream encoded by an inner encoder. 도 1에 도시한 바와 같이, 더 높은 층에서 발신하는, 송신될 정보의 비트 스트림 (102) 이 송신 버퍼 (104) 로 제공된다. As shown in Figure 1, there is provided a further, the bit stream 102, the transmission buffer 104 of the information to be transmitted originating from higher layers. 송신 버퍼를 도 2에 더욱 상세하게 도시하였다. The transmit buffer is illustrated in more detail in Figure 2. 도 2를 참조하면, 비트가 (도 1의) 송신 버퍼 (104) 의 시스터매틱 (systematic) 부분 (204(1)) 을 좌로부터 우로 로우 ×로우 (row by row) 로 채운다. 2, the bits are filled with (in Fig. 1) Sister Matic (systematic) portion (204 (1)) × row and right row (row by row) from the left in the transmission buffer (104). 시스터매틱 부분 (204(1)) 은 길이 L의 k개의 로우 (208) 를 포함한다. Sister and schematic section (204 (1)) comprises k rows 208 of length L. 다시, 도 1을 참조하면, (도 2의) 시스터매틱 부분 (204(4)) 이 채워지면, 외부 블록 인코더 (106) 는 (도 2의) 시스터매틱 부분 (204(1)) 에서 비트의 컬럼-방향 인코딩을 수행하도록 활성화되어 패리티 비트의 (도 2의) (nk) 추가 로우 (210) 를 생성한다. Again, with reference to Figure 1, (in Fig. 2) Sister matic part (204 4) When the filling, the outer block encoder 106 (of FIG. 2) of bits in the Sister schematic section (204 (1)) column-direction is enabled to perform the encoding to generate a parity bit (Fig. 2) (nk) additional rows 210. 이러한 컬럼-방향 동작은 바이너리 외부 코드, 즉, m=1에 대해 컬럼 ×컬럼으로 수행된다. The column-direction operation is binary outer code, i.e., is performed in a column for a column × m = 1. 비-바이너리 코드, 즉, m > 1에 대해, 로우에서의 모든 m개 근접 컬럼은 m-비트 심볼로서 취급된다. Non-on binary code, i.e., m> 1, every m columns of one-up in a low is treated as m- bit symbols. 상위 k 로우를 따른 m-비트 심볼은 외부 인코더에 의해 판독되어 이들 컬럼의 더 낮은 nk개 로우를 채우는 nk개 m-비트 심볼을 생성한다. m- bit symbols along the top k rows are read by the outer encoder to produce the nk dog m- bit symbols to fill the lower nk rows of these columns. 외부 인코더는 예를 들어, 시스터매틱 리드-솔로몬 (Reed-Solomon : RS) 인코더를 포함한다. The outer encoder is, for example, sister schematic Reed-Solomon (Reed-Solomon: RS) includes an encoder. 다시, 도 1을 참조하면, 송신 버퍼 (104) 의 컨텐츠는 물리층 (108) 에 제공된다. Referring again, to Figure 1, the content of the transmit buffer 104 is provided to the physical layer 108. 물리층 (108) 에서, 개별 프레임이 내부 인코더 (도시 생략) 에 의해 인코딩되어 인코딩된 프레임을 발생시킨다. In the physical layer 108, the individual frames are encoded by an inner encoder (not shown) to generate an encoded frame. 내부 디코더의 구조는 당업자에게 널리 공지되어 있다. The structure of the inner decoder may is well known to those skilled in the art. 버퍼의 시스터매틱 로우와 패리티 로우는 송신 동안 인터레이스될 수도 있어서 내부 코드 이레이저의 전체 수가 외부 코드의 정정 능력을 초과할 때 이레이저되는 다수의 시스터매틱 로우의 기회를 감소시킨다. Sister schematic row of the buffer and the parity rows reduces the chance of large number of sister schematic row where the laser when the total number of inner code yireyi my method may be interlaced during transmission to exceed the correction capability of the outer code. 프레임은 선택된 변조 구조, 예를 들어, cdma2000, WCDMA, UMTS, 및 당업자에게 공지되어 있는 다른 변조 구조에 따라 더 처리된다. The frame for the selected modulation scheme, for example, is further processed according to a different modulation scheme well known to cdma2000, WCDMA, UMTS, and those skilled in the art. 그 후, 처리된 프레임은 통신 채널 (110) 을 통해 송신된다. Then, the processed frame is transmitted over the communication channel 110. 송신된 프레임은 수신국에 수신되어 물리층 (112) 에 제공된다. The transmitted frames are received at the receiving station is provided to the physical layer 112. The 물리층 (112) 에서, 개별 프레임이 복조되어 내부 디코더 (도시 생략) 에 제공된다. In the physical layer 112, the individual frames are demodulated and provided to the inner decoder (not shown). 내부 디코더는 각 프레임을 디코딩하고, 디코딩이 성공적인 경우에, 정확하게 디코딩된 프레임을 출력하고, 디코딩이 실패인 경우에, 이레이저를 선언한다. If the inner decoder to decode each frame, and if the decoding is successful, outputs a correctly decoded frame, and the decoding is unsuccessful, declares the laser. 디코딩의 성공 또는 실패는 높은 정확도로 결정되어야 하고, 예를 들어, 외부 인코딩 이후 및 내부 인코딩 이전에 긴 (예를 들어, 16-비트) 순환 리던던시 검사 (CRC) 를 포함함으로써 달성된다. The success or failure of decoding must be determined with high accuracy, and for example, is accomplished by previously since outer encoding and an inner encoding, including a long (for example, 16-bit) cyclic redundancy check (CRC). 디코딩된 프레임으로부터 얻어진 포함된 CRC는 디코딩된 프레임의 비트로부터 계산된 CRC와 비교되고, 2개의 CRC가 동일한 경우에, 디코딩은 성공을 선언한다. Included CRC obtained from the decoded frame is compared with the calculated from the bits of the decoded frame, CRC, when the CRC of two identical, the decoding is declared successful. 내부 디코더가 프레임을 디코딩할 수 없는 경우에, 디코더는 이레이저를 선 언하고, 프레임 분실 표시를 외부 블록 디코더 (116) 에 제공한다. If the inner decoder can not decode the frame, the decoder declares the laser, and provides the frame loss displayed on the external block decoder 116. 처리는, 이레이저된 시스터매틱 프레임이 있을 때와 같은 수의 수신 버퍼 (114) 의 패리티 부분 (114(2)) 에 정확하게 수신되고 패스된 패리티 프레임이 있을 때 까지 계속된다. Process is continued until the correctly received in the parity part 114 (2) the number of receive buffers 114, such as a laser have a sister schematic frame when there is a parity frame path. 수신기는 어떠한 나머지 프레임의 수신을 중지하고 외부 디코더 (도시 생략) 는 이레이저된 시스터매틱 프레임을 복구하기 위해 활성화된다. The receiver stops the reception of any remaining frames (not shown) external decoder is enabled to restore the laser sister schematic frame. 복구된 시스터매틱 프레임은 상위 층으로 패스된다. Recovered sister schematic frame is path to a higher layer. 디코딩/에러 정정 계산 복잡도가 송신 버퍼 (104) 에서의 로우의 수의 값에 따라 증가한다는 것은 당업계에 널리 공지되어 있다. That a decoding / error correcting computation complexity increases with the value of the number of rows in the transmit buffer 104 is well known in the art. 디코딩/에러 정정 계산 복잡도가 수신 단말기에서의 하드웨어 복잡도 뿐만 아니라 전력 소모에 영향을 미치기 때문에, 방법 및 시스템에 대한 요구가 존재한다. Because the decoding / error correcting computation complexity affects the power consumption as well as the hardware complexity of the receiving terminal, there is a need for a method and system. 본 명세서에 개시한 실시형태들은 외부 코드를 갖는 복수의 버퍼 각각에서의 시스터매틱 비트를 인코딩하고, 복수의 버퍼의 컨텐츠를 멀티플렉싱하고, 프레임 세트를 제공하기 위해 상기 멀티플렉싱된 컨텐츠를 내부 코드로 인코딩함으로써 방법을 실행하는 시스템 및 방법을 제공함으로써 상기 요구를 해결한다. The embodiments disclosed herein are by encoding into the code the multiplexed content to provide a plurality of sister schematic encoded bits, and a frame set multiplexed content, and the plurality of buffers in the buffer, each having an external code by providing a system and method for carrying out the method solves the above requirements. 발명의 또 다른 양태에서, 프레임의 수신된 세트는 내부 디코더에 의해 디코딩되고, 정확하게 디코딩된 프레임은 복수의 버퍼로 디-멀티플렉싱되고, 각 버퍼의 컨텐츠는 더 처리된다. In a further aspect of the invention, the received set of frames is decoded by the inner decoder, the correctly decoded frames are de-of a plurality of buffer-multiplexed, the content of each buffer is further processed. 버퍼의 시스터매틱 부분이 정확하게 디코딩되었다면, 처리는 시스터매틱 부분의 컨텐츠를 더 높은 층에 제공하는 것을 포함한다. If the sister schematic of the buffer is decoded correctly, the processing comprises providing the content of sister schematic portion in a higher layer. 또 다른 방법으로는, 외부 디코더에 의한 버퍼 컨텐츠의 디코딩이 시스터매틱 부분을 복구하였다고 결정되면, 외부 디코더는 활성화되고 시스터매틱 부분의 정확하게 수신된 컨텐츠와 함께 복구된 컨텐츠는 더 높은 층으로 제공된다. Alternatively, if the decoding of the buffer content by an external decoder determines that repair Sister schematic section, the outer decoder is activated and recovery with the received content, exactly in the Sister schematic partial content is provided to a higher layer. 도 1은 종래의 물리층 처리를 도시하는 도면이다. 1 is a view showing a conventional physical layer processing. 도 2는 송신 버퍼를 도시하는 도면이다. Figure 2 is a view showing a transmission buffer. 도 3은 본 발명의 일 실시형태에 따른 물리층 처리를 도시하는 도면이다. Figure 3 is a diagram showing the physical layer processing in accordance with one embodiment of the invention. 본 명세서에서, "예시적" 이라는 단어는 "예, 경우, 또는 실례로서 이용할 수 있다" 라는 의미로 사용된다. In this specification, the word "exemplary" is used to mean "example, instance, or it may be used as an illustration." "예시적"으로 본 명세서에 설명한 임의의 실시형태는 다른 실시형태 이상으로 바람직하거나 유용하다는 것으로 해석할 필요는 없다. Any embodiment described herein as "exemplary" is not necessarily to be construed as preferred or that is useful over other embodiments. 본 명세서에서, 점 대 점 (point-to-point) 이라는 용어는 전용 통신 채널을 통한 2개 가입자국 사이의 통신을 의미하는 것으로 사용된다. As used herein, the term point-to-point (point-to-point) is used herein to mean a communication between two subscriber station over a dedicated communication channel. 본 명세서에서, 방송 통신 또는 점 대 다중점 (point-to-multipoint) 통신이라는 용어는 복수의 가입자국이 하나의 소스로부터 통신을 수신하는 통신을 의미하는 것으로 사용된다. In this specification, the terms broadcast communication or point-to-multipoint (point-to-multipoint) communication is used herein to a plurality of subscriber stations is defined as a communication comprising: receiving a communication from one source. 본 명세서에서, 패킷이라는 용어는 데이터 (페이로드) 및 제어 엘리먼트를 포함하고, 특정 포맷으로 배열된 비트의 그룹을 의미하는 것으로 사용된다. The term in this specification, packet is used herein to include the data (payload) and control elements, and means a group of bits arranged into a specific format. 제어 엘리먼트는 예를 들어, 프리앰블, 품질 매트릭스, 및 당업자에게 공지되어 있는 다른 것을 포함한다. Control elements include, for example, others known to a preamble, a quality matrix, and those skilled in the art. 품질 매트릭스는 예를 들어, 순환 리던던시 검사 (CRC), 패리티 비트, 및 당업자에게 공지되어 있는 다른 것을 포함한다. Quality metrics include, for example, a cyclic redundancy check (CRC), a parity bit, and one of ordinary skill in the art that other well known. 본 명세서에서, 액세스 네트워크라는 용어는 기지국 (BS) 과 하나 이상의 기지국의 제어기의 집합 (collection) 을 의미하는 것으로 사용된다. In this specification, the term access network is used herein to mean a set (collection) of the base station (BS) and the controller of one or more base stations. 액세스 네트워크는 다중 가입자국 사이에서 데이터 패킷을 전송한다. Access network transports data packets between multiple subscriber stations. 액세스 네트워크는 코퍼레이트 인트라넷 또는 인터넷과 같은 액세스 네트워크 외부의 추가의 네트워크에 접속될 수도 있고, 각 액세스 단말기와 외부 네트워크 사이에서 데이터 패킷을 전송할 수도 있다. The access network may be connected to additional networks outside the access network, such as a corporate intranet or the Internet, and may transmit the data packets between each access terminal and outside networks. 본 명세서에서, 기지국이라는 용어는 가입자국이 통신하는 하드웨어를 의미하는 것으로 사용된다. In this specification, the term base station is used herein to mean the hardware with which the subscriber stations communicate. 셀은 용어가 사용되는 컨텍스트에 의존하는 하드웨어 또는 지리적 통신가능 영역을 칭한다. Cell refers to the hardware or a geographic coverage area depending on the context in which the term is used. 섹터는 셀의 파티션이다. A sector is a partition of a cell. 섹터가 셀의 속성을 갖기 때문에, 셀과 관련하여 설명하는 바가 섹터에 쉽게 확장된다. Because a sector has the attributes of a cell, a bar that is described in relation to the cell is readily extended to sectors. 본 명세서에서, 가입자국이라는 용어는 액세스 네트워크가 통신하는 하드웨어를 의미하는 것으로 사용된다. The term used herein, the subscriber station is used herein to mean the hardware with which an access network communication. 가입자국는 이동 또는 정지 (mobile or stationary) 일 수도 있다. Sign up may be jagukneun moving or stationary (mobile or stationary). 가입자국은 예를 들어, 무선 채널을 통하거나 광 섬유 또는 동축 케이블을 사용하여 유선 채널을 통하여 통신하는 임의의 데이터 장치일 수도 있다. A subscriber station may be, for example, to through a radio channel, or using an optical fiber or a coaxial cable may be any data device that communicates through a wired channel. 가입자국은 PC 카드, 컴팩트 플래시, 외부 또는 내부 모뎀, 또는 무선 또는 유선 전화를 포함하지만 거기에 한정되지 않는 임의의 다수의 형태의 장치일 수도 있다. A subscriber station may be a PC card, compact flash, external or internal modem, or wireless or wireline phone include, but there is any of a number of types of devices including but not limited to. 기지국과의 활성 트래픽 채널 접속을 확립중인 가입자국은 접속 설정 상태이다고 말할 수 있다. Subscriber station is being established an active traffic channel connection with a base station can be said is the connection settings. 기지국과의 활성 트래픽 채널 접속을 확립한 가입자국은 활성 가입자국이라 칭하고, 트래픽 상태이다고 한다. Subscription that has established an active traffic channel connection with a base station is high is referred to as an active subscriber station, a traffic state. 본 명세서에서, 물리 채널이라는 용어는 변조 특성 및 코딩에 관하여 설명한 신호가 전파하는 통신 라우트를 의미하는 것으로 사용된다. As used herein, the term physical channel is used herein to mean a communication route to a radio wave signal described in relation to modulation characteristics and coding. 본 명세서에서, 논리 채널이라는 용어는 기지국 또는 가입자국의 프로토콜 층 내의 통신 라우트를 의미하는 것으로 사용된다. As used herein, the term logical channel is used herein to mean a communication route within the protocol layers of its own base station or register. 본 발명에서, 통신 채널/링크라는 용어는 컨텍스트에 따라 물리 채널 또는 논리 채널을 의미하는 것으로 사용된다. In the present invention, the term communication channel / link is used herein to mean a physical channel or a logical channel in accordance with the context. 본 명세서에서, 리버스 통신 채널/링크라는 용어는 가입자국이 기지국으로 신호를 전송하는 통신 채널/링크를 의미하는 것으로 사용된다. As used herein, the term reverse communication channel / link is used herein to mean a communication channel / link to the subscriber station sends signals to the base station. 본 명세서에서, 포워드 채널/링크는 기지국이 가입자국으로 신호를 전송하는 통신 채널/링크를 의미하는 것으로 사용된다. In this specification, the forward channel / link is used herein to mean a communication channel / link, the base station transmits a signal to the subscriber station. 본 명세서에서, 소프트 핸드-오프라는 용어는 가입자국과 2개 이상의 섹터 사이의 통신을 의미하는 것으로 사용되며, 여기서, 각 섹터는 상이한 셀에 속한다. In the present specification, the soft hand-Oprah term is used herein to mean a communication between a subscriber station and two or more sectors, wherein each sector belongs to a different cell. 리버스 링크 통신은 모든 섹터에 의해 수신되고, 포워드 링크 통신은 2개 이상의 섹터의 포워드 링크를 통해 동시에 반송된다. Reverse link communication is received by all the sectors, and the forward link communication is simultaneously conveyed through the forward link to more than one sector. 본 명세서에서, 소프터 (softer) 핸드-오프라는 용어는 가입자국과 2개 이상의 섹터 사이의 통신을 의미하는 것으로 사용되고, 여기서, 각 섹터는 동일한 셀에 속한다. In this specification, the softer (softer) hand-Oprah term is used herein to mean a communication between a subscriber station and two or more sectors, wherein each sector belongs to the same cell. 리버스 링크 통신은 모든 섹터에 의해 수신되고, 포워드 링크 통신은 2개 이상의 섹터의 포워드 링크중의 하나를 통해 동시에 반송된다. Reverse link communication is received by all the sectors, and the forward link communication is simultaneously conveyed through one of the two or more forward link sector. 본 명세서에서, 이레이저라는 용어는 메시지 인식 실패를 의미하는 것으로 사용된다. As used herein, the term laser is used to mean failure to recognize a message. 본 명세서에서, 전용 채널이라는 용어는 개별 가입자국에 특정한 정보에 의해 변조되는 채널을 의미하는 것으로 사용된다. As used herein, the term dedicated channel is used herein to mean a channel modulated by information specific to the individual subscriber station. 본 명세서에서, 공통 채널이라는 용어는 모든 가입자국 사이에 공유된 정보에 의해 변조된 채널을 의미하는 것으로 사용된다. As used herein, the term common channel is used herein to mean a channel modulated by information shared among all subscriber stations. 본 명세서에서, 물리층이라는 용어는 데이터의 송수신에 응답할 수 있는 발신 단말기와 수신 단말기 사이의 통신 프로토콜의 일부분을 의미하는 것으로 사용된다. As used herein, the term physical layer is used herein to mean a part of the communication protocol between the calling terminal and the called terminal that can respond to the transmission and reception of data. 물리층은 개방 시스템간 접속에 대한 국제 표준 구성 모델에서의 층 1에 대응한다. The physical layer corresponds to Layer 1 in the International standard configuration model for connections between open systems. 본 명세서에서, 상위 층(들) 이라는 용어는 물리층의 상부에 있는 발신 단말기와 수신 단말기 사이의 통신 프로토콜의 일부분을 의미하는 것으로 사용된다. As used herein, the term higher layer (s) is used herein to mean a part of the communication protocol between the calling terminal and the called terminal at the top of the physical layer. 상위 층은 개방 시스템간 접속에 대한 국제 표준 구성 모델에서의 층 2 내지 7에 대응한다. The upper layer corresponds to the layer 2 to 7 in the international standard configuration model for connections between open systems. 도 3에 도시한 바와 같은, 본 발명의 일 실시형태에 따라, 상위 층에서 발신하는, 송신될 정보의 비트 스트림 (302) 이 디-멀티플렉싱되어 송신 버퍼 (304(i)) 로 제공된다. Figure according to one, embodiment of the present invention as shown in Figure 3, the bit stream 302 of information to be transmitted originating from the upper layer de-multiplexed is available in the transmission buffer (304 (i)). 비트는 좌로부터 우로 로우 ×로우로 송신 버퍼 (304(1)) 의 시스터매틱 부분 (306(1)) 을 채운다. Bit is filled with a sister schematic section (306 (1)) of the transmission buffer (304 1) to the right from the left rows × row. 시스터매틱 부분 (306(1)) 은 길이 L의 k개 로우를 포함한다. Sister and schematic section (306 (1)) comprises k rows of length L. 일 실시형태에서, 버퍼의 길이 L은 오버헤드가 없는 (예를 들어, 내부 디코더를 돕기 위한 CRC 및 내부 인코더에 대한 꼬리 비트) 무선 프 레임의 길이와 일치한다. In one embodiment, the length L of the buffer coincides with the length without the overhead (e. G., Tail bits for the inner encoder, and CRC to help the inner decoder) radio frame. 송신 버퍼 (304(1)) 의 시스터매틱 부분 (306(1)) 이 채워지면, 나머지 송신 버퍼 (304(2) - 304(p)) 에 대해 절차가 반복된다. The procedure is repeated for-transmission buffer (304 1) Sister matic part (306 1) is ground, the rest of the transmission buffer fill (304 (p), 304 (2)) of. 송신 버퍼 (304(i)) 의 시스터매틱 부분 (306(i)) 이 채워지면, 외부 블록 인코더 (310(i)) 는 시스터매틱 부분 (306(i)) 에서 비트의 컬럼-방향 인코딩을 수행하기 위해 활성화되어 패리티 비트 (308(i)) 의 (nk) 개 추가의 로우를 생성한다. When the filled Sister matic part (306 (i)) of the transmission buffer (304 (i)), the outer block encoder (310 (i)) is a column of bits in the Sister matic part (306 (i)) - do the direction encoding It is active to produce the (nk) pieces of the row of the parity bit (308 (i)). 이러한 컬럼-방향 연산은 2진 외부 코드, 즉, m=1에 대해 컬럼 ×컬럼으로 수행된다. The column-direction operation is binary outer code, i.e., is performed in a column for a column × m = 1. 비-2진 코드, 즉, m>1에 대해, 로우에서 모든 m 인접 컬럼은 m-비트 심볼로서 취급된다. -2 for a non-binary code, i.e., m> 1, every m adjacent columns in a row are treated as an m- bit symbols. 상부 k개 로우를 따르는 m-비트 심볼이 외부 인코더에 의해 판독되어 이들 컬럼의 대응하는 하위 nk개 로우를 채우는 nk개 m-비트 심볼을 생성한다. Is m- bit symbols along the top k rows are read by the outer encoder to produce the nk dog m- bit symbols that fill the corresponding lower nk rows of these columns. 또 다른 실시형태에서, 버퍼의 길이 L은 외부 인코더 코드의 치수인, m으로 분할된 오버헤드가 없는 무선 프레임의 비트 수와 동일하다. In yet another embodiment, the length L of the buffer is equal to the number of bits of a radio frame without the overhead divided by the dimension of the outer encoder code, m. 이 실시형태에서, 전체 버퍼가 송신될 때 까지, 송신 버퍼 (304(i)) 로부터의 제 1 m개 로우는 제 1 무선 프레임으로 전송되고, 비트의 제 2 m개 로우는 제 2 무선 프레임으로 전송된다. In this embodiment, until the entire buffer is transmitted, the first m rows from the transmit buffer (304 (i)) are transmitted in a first radio frame, the second m rows of bits in the second radio frame It is transmitted. 송신 버퍼 (304(1)) 의 시스터매틱 부분 (306(1)) 이 채워지면, 나머지 송신 버퍼 (304(2) - 304(p)) 에 대해 절차가 반복된다. The procedure is repeated for-transmission buffer (304 1) Sister matic part (306 1) is ground, the rest of the transmission buffer fill (304 (p), 304 (2)) of. 송신 버퍼 (304(i)) 의 시스터매틱 부분 (306(i)) 이 채워지면, 외부 블록 인코더 (310(i)) 는 시스터매틱 부분 (304(i)) 에서 비트의 컬럼-방향 인코딩을 수행하기 위해 활성화되어 패리티 비트 (308(i)) 의 m(nk) 개 추가의 로우를 생성한다. When the filled Sister matic part (306 (i)) of the transmission buffer (304 (i)), the outer block encoder (310 (i)) is a column of bits in the Sister matic part (304 (i)) - do the direction encoding the m (nk) of the parity bit is enabled (308 (i)) generating one additional row of to. 이러한 컬럼-방향 연산은 2진 외부 코드, 즉, m=1에 대해 컬럼 ×컬럼으로 수행된다. The column-direction operation is binary outer code, i.e., is performed in a column for a column × m = 1. 비-2진 코드, 즉, m>1에 대해, 컬럼의 모든 m-로우는 m-비트 심볼을 형성한다. -2 for a non-binary code, i.e., m> 1, and all m- rows in the column are formed in the m- bit symbols. 컬럼에서의 상부 k개 로우로부터의 k개 심볼은 외부 인코더에 의해 판독되어 이러한 컬럼의 대응하는 하위 m(nk) 개 로우를 채우는 (nk) 개 m-비트 심볼을 생성한다. k pieces from the top k rows of symbols in the column produces a corresponding lower m (nk) one (nk) dog m- bit symbols that fill the rows of this column are read by the outer encoder. 일 실시형태에서, 외부 인코더 (310(i)) 는 시스터매틱 리드-솔로몬 (RS) 인코더를 포함한다. In one embodiment, the outer encoder (310 (i)) is a schematic sister lead-in comprises Solomon (RS) encoder. 그 후, 송신 버퍼 (304(i)) 의 컨텐츠는 멀티플렉서 (312) 로 제공된다. Then, the contents of the transmission buffer (304 (i)) is provided to the multiplexer 312. 멀티플렉서 (312) 는 송신 버퍼 (304(1) - 304(p)) 를 통해 순환하여, 소정의 비트 수를 포함하는 비트 블록이 이전의 버퍼 (304(i-1)) 로부터 전송된 이후에 연속 송신 버퍼 (304(1)) 를 선택한다. Multiplexer 312 is a transmission buffer (304 (1) - 304 (p)) continuous after being transmitted from the circulation, the buffer the previous bit block (304 (i-1)) including a predetermined number of bits through selects a transmission buffer (304 (1)). 일 실시형태에서, 블록에서의 소정의 수의 비트는 L과 동일하다. In one embodiment, the predetermined number of bits in the block is the same as L. 이러한 방법은 버퍼 (304(i)) 사이의 물리 채널 (316) 의 방해로 인해 초래되는 데이터의 손상을 균일하게 분배하려는 것이다. These methods are intended to uniformly distribute corruption of data caused by disturbance of a physical channel (316) between the buffer (304 (i)). 그러나, 다른 멀티플렉싱 방법이 동일하게 응용 가능하고, 본 발명의 사상 또는 범위를 벗어나지 않고 활용될 수 있다는 것을 당업자는 이해할 것이다. However, those skilled in the art that other multiplexing methods are equally possible applications, and can be utilized without departing from the spirit or scope of the invention will be appreciated. 비트의 멀티플렉싱된 블록은 발신 단말기의 물리 층 (314) 에 제공된다. The multiplexed blocks of bits are provided to the physical layer 314 of the originating terminal. 물리 층 (314) 에서, 추가의 오버헤드 비트 (예를 들어, CRC 검사) 는 비트 블록 각각에 가산되고, 결과적인 구조가 인코딩된 프레임을 발생시키는 내부 인코더 (도시 생략) 에 의해 인코딩된다. In the physical layer 314, additional overhead bits (e. G., CRC check) are encoded by an inner encoder (not shown) that is added to each bit block, generating a resulting structure is encoded frames. 외부 및 내부 인코더와 멀티플렉서의 구조는 예를 들어, 도 3의 구조일 수도 있다. External and internal structures of the encoder and the multiplexer, for example, may be a structure of Fig. 프레임은 선택된 변조 구조에 따라 더 프로세스된다. The frame is further processed according to the selected modulation scheme. 일 실시형태에서, IS-2000 표준에 따라 프로세싱이 수행된다. In one embodiment, this processing is carried out according to the IS-2000 standard. 그 후, 프로세스된 프레임이 통신 채널 (316) 을 통해 송신된다. Thereafter, the process frame is transmitted over the communication channel 316. 송신된 프레임은 수신국 (도시 생략) 에서 수신되어, 수신국에서의 물리 층 (318) 에 제공된다. A transmitted frame is received at a receiving station (not shown), it is provided to the physical layer 318 at the receiving station. 물리 층 (318) 에서, 개별 프레임이 복조되어 내부 디코더 (도시 생략) 에 제공된다. In the physical layer 318, the individual frames are demodulated and provided to the inner decoder (not shown). 일 실시형태에서, 내부 디코더는 각 프레임을 디코딩하고, 디코딩이 성공적인 경우에, 정확하게 디코딩된 프레임을 출력하거나, 디코딩이 실패인 경우에, 이레이저를 선언한다. In one embodiment, the inner decoder decodes each frame, and in the case where, if the decoding is successful, outputs a correctly decoded frame, or the decoding is unsuccessful, declares the laser. 디코딩의 성공 또는 실패는 높은 정확도로 결정되어야 한다. The success or failure of decoding must be determined with high accuracy. 일 실시형태에서, 정확도는 전술한 바와 같이, 외부 인코딩 이후 및 내부 인코딩 이전에 프레임에서의 긴 (예를 들어, 16-비트) 순환 리던던시 검사 (CRC) 를 포함함으로써 달성된다. In one embodiment, the accuracy is achieved by including a long (for example, 16-bit) cyclic redundancy check (CRC) in the frame after outer encoding and before inner encoding as discussed above. 그러나, 프레임 품질을 표시하기 위한 다른 메카니즘이 사용될 수도 있다는 것을 당업자는 인식할 것이다. However, those skilled in the art that other mechanisms may be used for displaying a frame quality will recognize. 디코딩된 프레임으로부터 얻어진 포함된 CRC는 디코딩된 프레임의 비트로부터 계산된 CRC와 비교되고, 2개의 CRC가 동일한 경우에, 그 디코딩이 성공인 것으로 선언된다. Included CRC obtained from the decoded frame is compared with the calculated from the bits of the decoded frame, CRC, if the two CRC same is declared that the decoding is successful. 물리 층에서의 다른 프로세싱이 내부 디코더 결정의 결과에 따라 계속된다. The other processing at the physical layer is continued in accordance with the result of the inner decoder decision. 정확하게 디코딩된 프레임은 멀티플렉싱을 위해 사용된 방법에 반대 방법을 사용하는, 수신 버퍼 (322(i)) 사이에 정확하게 디코딩된 프레임을 분배하는 디-멀티플렉서 (320) 에 제공된다. The correctly decoded frames are used in the opposite way to the procedure used for the multiplexing, the reception buffer (322 (i)) D which distributes the correctly decoded frames among - are provided to the multiplexer 320. 모든 시스터매틱 k개 프레임이 특정한 수신 버퍼 (322(i)) 에 대해 내부 디코더에 의해 정확하게 디코딩된 경우에, 수신 버퍼 (322(i)) 의 시스터매틱 부분 (324(i)) 으로부터의 시스터매틱 프레임은 상위 층에 제공된다. All Sister schematic k frames are sister schematic from a particular receive buffer (322 (i)) if the correctly decoded by the inner decoder for the receiving buffer (322 (i)) Sister matic part (324 (i)) of frame is provided to the upper layer. 내부 디코더가 프레임을 디코딩할 수 없는 경우에, 디코더는 이레이저를 선언하고, 프레임이 손실되었다는 표시를 디-멀티플렉서 (324) 에 제공한다. If the inner decoder can not decode the frame, the decoder declares a laser, and an indication that a frame is lost de-provided to the multiplexer 324. 디- 멀티플렉서 (324) 는 프레임이 속하는 수신 버퍼 (322(i)) 에 통신가능하게 연결된 외부 블록 디코더 (328(i)) 에 정보를 제공한다. De-multiplexer 324 provides the information to the receiving buffer (322 (i)) outside the block decoder (328 (i)) communicatively coupled to the frame to which it belongs. 시스터매틱 프레임 및 시스터매틱 부분 (324(i)) 에 누적된 정확하게 수신된 패리티 프레임 및 수신 버퍼 (322(i)) 의 패리티 부분 (326(i)) 이 충분히 있거나, 수신 버퍼 (322(i)) 가 채워질 때 까지 프로세스는 계속된다. Sister schematic frame and Sister matic part (324 (i)), the received parity part of the parity frame and a receive buffer (322 (i)) (326 (i)) is the receive buffer (322 sufficiently, or accurately stacked in a (i) ) the process continues until filled. 그 후, 외부 디코더 (도시 생략) 가 이레이저된 시스터매틱 프레임을 복구하기 위해 활성화된다. Then, the external decoder (not shown) is activated to recover the laser sister schematic frame. 복구된 시스터매틱 프레임은 상위 층으로 제공된다. Recovered sister schematic frame is provided to a higher layer. 일 실시형태에 따라, 수신 버퍼 (322(i)) 에 정확하게 수신된 프레임의 전체 수가 k 보다 작은 경우에, 디코딩이 성공이다는 보장이 없기 때문에 외부 디코더를 활성화되지 않는다. According to one embodiment, the receive buffer (322 (i)) the total number of frames received is less than k when the exact, since there is no guarantee that the decoding is successful does not enable external decoder. 손실 비트의 식별과 함께 정확하게 수신된 시스터매틱 프레임은 상위 층으로 제공된다. Correctly received with the identification of the lost bits sister schematic frame is provided to a higher layer. 또 다른 실시형태에서, 수신기는 시스터매틱 비트에 대한 비트를 복구하기 위해 (실패한 CRC 검사에 의해 표시되는 바를 신뢰할 수 없는) 내부 디코더로부터의 디코딩된 비트를 사용한다. In yet another embodiment, the receiver uses decoded bits from the inner decoder to recover a bit of the sister schematic bits (failed unreliable bar displayed by the CRC check). 일 실시형태에 따라, 수신기는 내부 디코더로부터의 신뢰할 수 없는 비트를 디코딩하고 가장 가능성 있는 코드워드를 찾는다. According to one embodiment, the receiver decodes the unreliable bits from the inner decoder, and can find the most probable code word. 또 다른 실시형태에서, 수신기는 가장 높은 신호 대 잡음비를 갖는 잘못 수신된 프레임을 선택하기 위해 버퍼내의 이레이저된 프레임의 신호 품질의 측정을 사용하여 k개 로우를 갖는 서브 버퍼를 형성한다. In another embodiment, the receiver can use this measurement of the signal quality of the laser frame in the buffer to select the incorrectly received frames with the highest signal-to-noise ratio to form a sub buffer with k rows. 그 후, 수신기는 비트 플립핑 (flipping) (동시에 컬럼에서 0의 비트값을 1의 비트값으로 변화시키는 및 그 역도 가능) 을 수행하고 비트 플립핑이 코드워드를 발생시키는지 여부를 검사한다. Thereafter, the receiver determines whether or not to perform a bit-flipping (flipping) (at the same time and vice versa is possible to change a bit value of 0 to the bit value of 1 in the column), and the bit flipping is generated codewords. 일 실시형태에서, 비트 플립핑이 최소 신뢰 가능한 비트에 대해 먼저 수행되고 비트의 증가하는 신뢰도의 순서로 비트와 계속된다. In one embodiment, the bit flipping is first performed and continues for at least reliable bits and bits in increasing order of reliability of the bit. 비트의 신뢰도는 내부 디코딩 매트릭스, 예를 들어, 야마모토 매트릭스와 유사한, 프레임 동안의 신호 대 잡음 및 간섭비, 재-인코딩된 심볼 에러 레이트, 재-인코딩된 에너지 매트릭스, 및 당업자에게 공지되어 있는 다른 매트릭스, 또는 매트릭스의 결합에 따라 결정될 수도 있다. Reliability of the bits inside the decoding matrix, for example, Yamamoto metrics and similar, the signal-to-noise and interference ratio during the frame, the re-encoded symbol error rate, re-encoded energy matrix, and are known to those skilled in the art other matrix , or it may be determined according to the combination of the matrix. 코드워드가 발견되지 않는 경우에, 비트 플립핑은 모든 신뢰할 수 없는 로우에 대한 모든 나머지 컬럼을 통해 계속된다. If the code word is not found, the bit flipping continues through all the remaining columns for all the rows that can not be trusted. 코드워드가 발견되지 않는 경우에, 비트 플립핑은 코드워드가 발견되거나 모든 결합이 소모될 때 까지, 플립핑된 비트의 증가된 수 (즉, 비트의 최대 수 까지, 동시에 2 비트, 그 후 3비트를 변화시킨다) 로 계속된다. If the code word is not found, the bit flipping is a codeword is found or until all of the combined consumption, the number of increase of the flip the ping-bit (that is, the bits up to a maximum number, at the same time, two-bit, then the third It continues to changes the bit). 또 다른 실시형태에서, 신뢰할 수 없는 로우로부터의 CRC가 이러한 상황에서의 디코딩의 전체적인 성공을 검사하기 위해 사용된다. In yet another embodiment, the CRC from the unreliable rows are used to check the overall success of the decoding in this situation. 모든 로우로부터의 CRC가 매칭된 경우에 프레임은 상위 층으로 제공되고, 매칭되지 않는 경우에, 신뢰 가능한 로우로부터의 비트만이 상위 층으로 제공된다. In if the CRC from all rows match the frame is provided to the upper layer, if it does not match, then only the bits from reliable rows are provided to the upper layer. 또 다른 실시형태에서, 디코딩의 신뢰도를 개선시키기 위해, 복조 및 내부 디코딩이 버퍼내의 k개 이상의 정확하게 수신된 프레임에 대해 수행된다. In yet another embodiment, is performed in order to improve the reliability of decoding, demodulation and inner decoding are correctly received for the frame k or more in the buffer. 또 다른 실시형태에 따라, 복조 및 내부 디코딩이 버퍼내의 모든 프레임에 대해 수행된다. According to yet another embodiment the demodulation and inner decoding are performed for all frames in the buffer. 모든 실시형태에서, 외부 디코딩이 가장 높은 품질을 갖는 k (또는 km) 개의 로우에 대해 수행된다. In all embodiments, it is performed on the k (or km) rows with the highest quality, the outer decoding. 품질은 내부 디코딩 매트릭스, 예를 들어, 야마모토 매트릭스와 유사한, 프레임 동안의 신호 대 잡음 및 간섭비, 재-인코딩된 심볼 에러 레이트, 재-인코딩된 에너지 매트릭스, 및 당업자에게 공지되어 있는 다른 매 트릭스, 또는 매트릭스의 결합에 따라 결정될 수도 있다. Quality interior decoding matrix, for example, Yamamoto metrics and similar, the signal-to-noise and interference ratio during the frame, the re-encoded symbol error rate, re-encoded energy matrix, and are known to those skilled in the art other Matrix with, or it may be determined according to the combination of the matrix. 품질 추정을 위한 품질 매트릭스의 사용은, 본 발명의 양수인에게 모두 양도된, "METHOD AND APPARATUS FOR DETERMINING THE RATE OF RECEIVED DATA IN A VARIABLE RATE COMMUNICATIONS SYSTEM" 이라는 명칭의 미국 특허 제 5,751,725 호 및 "METHOD AND APPARATUS FOR DETERMINING DATA RATE OF TRANSMITTED VARIABLE RATE DATA IN A COMMUNICATIONS RECEIVER" 이라는 명칭의 미국 특허 제 5,774,496 호에 상세히 개시되어 있다. Use of quality metrics for quality estimation is assigned both to the assignee of the present invention, "METHOD AND APPARATUS FOR DETERMINING THE RATE OF RECEIVED DATA IN A VARIABLE RATE COMMUNICATIONS SYSTEM" US Patent called Name claim 5,751,725 ​​No. and "METHOD AND APPARATUS fOR DETERMINING DATA RATE oF TRANSMITTED VARIABLE RATE DATA iN a COMMUNICATIONS RECEIVER "it has been disclosed in detail in U.S. Patent No. 5,774,496 in the name of Lake. 송신 버퍼 (304), 그에 따른 수신 버퍼 (322) 의 수는 프로세싱 오버헤드와 포텐셜 데이터 손실의 양 사이에서 절충안이라는 것을 당업자는 이해할 것이다. Those skilled in the art that the transmission buffer 304, the number of receive buffer 322 is accordingly a compromise between the amount of processing overhead and potential data loss will appreciate. 더 많은 송/수신 버퍼를 발생시키는 k의 작은 값은 증가한 프로세싱 오버헤드를 초래한다. A value of k to generate a more transmit / receive buffer will result in the increased processing overhead. 한편, 더 적은 송/수신 버퍼를 발생시키는 k의 큰 값은 송신 버퍼 사이즈의 증가를 초래하여, 송신 버퍼의 컨텐츠가 (nk) 개 이상의 로우 이레이저로 인해 복구될 수 없는 경우에 큰 블록을 폐기하게 한다. On the other hand, a value of k to generate less transmit / receive buffers will result in an increase in the transmit buffer size, discarding a large block, if the contents of the transmission buffer (nk) more than one row can not be recovered due to the laser It makes. 또한, 큰 버퍼 사이즈는 수신 단말기에서 메모리 요청을 증가시킨다. Moreover, a large buffer size increases the memory request from the receiving terminal. 정보 및 신호가 임의의 다양한 서로 다른 기술을 사용하여 표현될 수도 있다는 것을 당업자는 이해할 것이다. That information and signals may be represented using any of a variety of different techniques of those skilled in the art will appreciate. 예를 들어, 상기 상세한 설명 전반적으로 참조될 수도 있는 데이터, 지시, 명령, 정보, 신호, 비트, 심볼, 및 칩이 전압, 전류, 전자기파, 자계 또는 파티클, 광학계 또는 파티클, 또는 이들의 임의의 결합으로 표현될 수도 있다. For example, the following detailed description, which may be generally referred to as data, instructions, commands, information, signals, bits, symbols, and chips are voltages, currents, electromagnetic waves, magnetic fields or particles, optical system or particles, or any combination thereof as it may be represented. 본 명세서에 개시한 실시형태들과 관련하여 설명한 다양한 예시적인 논리 블록, 모듈, 회로, 및 알고리즘 단계가 전자 하드웨어, 컴퓨터 소프트웨어, 또는 이 들의 결합으로서 구현될 수도 있다는 것을 당업자는 이해할 것이다. Those skilled in the art that the various illustrative logical blocks described with respect to the embodiment described herein, modules, circuits, and algorithm steps described in connection with the electronic hardware, computer software, or be implemented as a combination of these will appreciate. 하드웨어 및 소프트웨어의 이러한 호환성을 명백하게 나타내기 위해, 다양한 예시적인 구성요소, 블록, 모듈, 회로, 및 단계를 그들의 기능성과 관련하여 일반적으로 설명하였다. In order to clearly illustrate this interchangeability of hardware and software, various illustrative components, blocks, modules, circuits, and steps have been described generally in terms of their functionality. 이러한 기능성은 전체 시스템에 부과된 특정한 애플리케이션 및 설계 제약에 따라 하드웨어 또는 소프트웨어로서 구현된다. Such functionality is implemented as hardware or software according to the particular application and design constraints imposed on the overall system. 당업자는 각 특정한 애플리케이션에 대해 다양한 방법으로 설명한 기능성을 구현할 수도 있지만, 본 발명의 범위를 벗어나는 것으로 해석되어서는 안된다. Those skilled in the art not to be construed as may implement the described functionality in varying ways for each particular application, but outside the scope of the invention. 본 명세서에 개시한 실시형태들과 관련하여 설명한 다양한 예시적인 논리 블록, 모듈, 및 회로는 본 명세서에 설명한 기능성을 수행하도록 설계된 범용 프로세서, 디지털 신호 프로세서 (DSP), 응용 주문형 집적 회로 (ASIC), 필드 프로그램 가능한 게이트 어레이 (FPGA) 또는 다른 프로그램 가능한 로직 장치, 개별 게이트 또는 트랜지스터 로직, 개별 하드웨어 구성요소, 또는 이들의 결합으로 구현 및 수행될 수도 있다. The various illustrative logical blocks described with respect to the embodiment described herein, modules, and circuits with a general purpose processor, a digital signal processor (DSP), an application specific integrated circuit (ASIC) designed to perform the functionality described herein, a field programmable gate array (FPGA) or other programmable logic device, discrete gate or transistor logic, discrete hardware components, or implemented in a combination thereof and may be carried out. 범용 프로세서는 마이크로프로세서일 수도 있지만, 또 다른 방법으로는, 프로세서는 임의의 통상의 프로세서, 제어기, 마이크로제어기, 또는 스테이트 머신일 수도 있다. A general-purpose processor may be a microprocessor, but in the alternative, the processor may be any conventional processor, controller, microcontroller, or state machine. 또한, 프로세서는 컴퓨팅 장치들의 결합, 예를 들어, DSP 및 마이크로프로세서의 결합, 복수의 마이크로 프로세서, DSP 코어와 연결된 하나 이상의 마이크로프로세서, 또는 다른 구성으로서 구현될 수도 있다. A processor may also be implemented as a combination of computing devices, e.g., a combination of a DSP and a microprocessor, a plurality of microprocessors, one or more microprocessors in conjunction with a DSP core, or any other such configuration. 본 명세서에 개시한 실시형태들과 관련하여 설명한 방법 또는 알고리즘의 단계는 하드웨어, 프로세서에 의해 실행되는 소프트웨어 모듈, 또는 이들의 결합에 직접 포함될 수도 있다. The steps of a method or algorithm described in connection with the embodiments disclosed herein may be incorporated directly in a combination of software modules, or those to be executed by the hardware processor. 소프트웨어 모듈은 RAM 메모리, 플래시 메모리, ROM 메모리, EPROM 메모리, EEPROM 메모리, 레지스터, 하드 디스크, 제거 가능한 디스크, CD-ROM, 또는 당업계에 공지되어 있는 임의의 다른 형태의 저장 매체에 상주할 수도 있다. A software module may reside in RAM memory, flash memory, ROM memory, EPROM memory, EEPROM memory, registers, hard disk, a removable disk, CD-ROM, any other form known in the art or the storage medium of the . 예시적인 저장 매체는 프로세서에 연결되고, 이 프로세서는 저장 매체로부터 정보를 판독하고 저장 매체로 정보를 기록할 수 있다. An exemplary storage medium is coupled to the processor such the processor can read information from, and write information to, the storage medium as the storage medium. 또 다른 방법으로는, 저장 매체는 프로세서에 필수적일 수도 있다. In the alternative, the storage medium may be integral to the processor. 프로세서 및 저장 매체는 프로세서에 필수적일 수도 있다. The processor and the storage medium may be integral to the processor. ASIC가 사용자 단말기에 상주할 수도 있다. The ASIC may reside in a user terminal. 또 다른 방법으로는, 프로세서 및 저장 매체가 사용자 단말기의 개별 구성요소로서 상주할 수도 있다. Alternatively, the processor and the storage medium may reside as discrete components in a user terminal. 개시한 실시형태들의 전술한 설명은 당업자가 본 발명을 제조하거나 사용할 수 있도록 제공된다. It discloses the foregoing description of the embodiments is provided to enable any person skilled in the art to make or use the present invention. 이들 실시형태들에 대한 다양한 변형이 당업자에게는 명백할 것이고, 본 명세서에 정의한 일반 원리가 본 발명의 사상 또는 범위를 벗어나지 않고 다른 실시형태에 적용될 수도 있다. It will be apparent to those and various modifications to these embodiments those skilled in the art, may be applied to other embodiments the generic principles defined herein without departing from the spirit or scope of the invention. 따라서, 본 발명은 본 명세서에 나타낸 실시형태들에 제한되는 것이 아니라 본 명세서에 개시한 원리 및 신규한 특징과 일치하는 가장 광범위한 범위를 부여한다. Accordingly, the present invention gives the widest scope not limited to the embodiments shown herein consistent with the principles and novel features disclosed herein. 이 특허 문헌의 개시물의 일부분은 저작권 보호에 영향을 받는 자료를 포함한다. Initiating a portion of water in this patent document contains material subject to copyright protection effect. 저작권 소유자는 특허 및 상표국 특허 파일에 나타나 있는 바와 같이, 특허 문헌 또는 특허 개시물에 의한 팩시밀리 복제에 이의를 갖지 않지만, 모든 저작권을 보유한다. The copyright owner has no objection to the facsimile reproduction by, but in Patent Document or patent disclosure, as shown in the patent and Trademark Office patent file, reserves all copyright. 프레임 세트를 제공하기 위해 상기 멀티플렉싱된 컨텐츠를 제 2 코드로 인코딩하는 단계를 포함하는, 인코딩 방법. Comprising the step of encoding the multiplexed frame to provide a set content to the second code, the encoding method. 상기 복수의 버퍼 각각에서의 상기 시스터매틱 비트를 블록 코드로 인코딩하는 단계를 포함하는, 인코딩 방법. , Encoding comprises encoding the sister schematic bit in the plurality of buffers, each with a block code. 상기 복수의 버퍼 각각에서의 상기 시스터매틱 비트를 리드-솔로몬 (Reed-Solomon) 코드로 인코딩하는 단계를 포함하는, 인코딩 방법. , Encoding comprises encoding by Solomon (Reed-Solomon) code - the sister schematic bits in the plurality of buffers, each lead. 상기 복수의 버퍼 각각으로부터 연속적으로 비트 블록을 제공하는 단계를 포함하는, 인코딩 방법. , The encoding method comprising the steps of: providing a continuous bit block from each of the plurality of buffers. 상기 복수의 버퍼 각각의 로우를 포함하는 비트 블록을 제공하는 단계를 포함하는, 인코딩 방법. , The encoding method comprising the steps of: providing a bit block including a respective row of the plurality of buffers. 상기 비트 블록을 상기 제 2 코드로 인코딩하는 단계를 포함하는, 인코딩 방법. , The encoding method comprising: encoding the bits in the second code block. 상기 버퍼로부터 수신된 비트 블록을 식별하는 단계를 포함하는, 인코딩 방 법. , The encoding method comprising the step of identifying a block of bits received from the buffer. 상기 복수의 버퍼 각각의 컨텐츠를 프로세싱하는 단계를 포함하는, 방법. The method comprises the step of processing the respective contents of the plurality of buffers. 상기 버퍼에 상기 비트 블록을 제공하는 단계를 포함하는, 방법. The method comprises the step of providing the bit block in the buffer. 제 2 디코더에 의해 디코딩된 프레임을 포함하는 비트 블록을 식별하는 단계를 포함하는, 방법. The method comprises identifying a bit block including the decoded frames by the second decoder. 상기 복수의 버퍼 각각의 시스터매틱 부분을 상위 층으로 제공하는 단계를 포함하는, 방법. The method comprising the steps of: providing a sister schematic portion of the plurality of buffers respectively, to the upper layer. 상기 수신된 프레임이 정확하게 디코딩되지 않은 경우에 정확하게 디코딩된 프레임을 수신하는 버퍼에 통신가능하게 연결된 디코더에 이레이저의 표시를 제공하는 단계를 더 포함하는, 방법. Method if the received frame is not correctly decoded in further comprising providing a display of my yireyi a decoder communicatively coupled to the buffer to receive the correctly decoded frame. 각 수신 버퍼의 컨텐츠를 프로세싱하는 단계를 포함하는, 방법. The method comprises the step of processing the content of each receive buffer. 상기 복수의 송신 버퍼 각각에서의 시스터매틱 비트를 블록 코드로 인코딩하는 단계를 포함하는, 방법. The method comprises the step of encoding the bits in the Sister-Matic each of the plurality of the transmission buffer on a block-by-block code. 상기 복수의 송신 버퍼 각각에서의 시스터매틱 비트를 리드-솔로몬 코드로 인코딩하는 단계를 포함하는, 방법. The method comprises the step of encoding by Solomon code - the sister schematic bits in the plurality of transmission buffers leads. 각 송신 버퍼로부터 연속적으로 비트 블록을 제공하는 단계를 포함하는, 방법. The method comprises providing a continuous bit block from each of the transmission buffer. 송신 버퍼의 로우를 포함하는 비트 블록을 제공하는 단계를 포함하는, 방법. The method comprises providing a bit block including the row of the transmission buffer. 상기 비트 블록을 제 2 코드로 인코딩하는 단계를 포함하는, 방법. The method comprises the step of encoding the bits in the second code block. 상기 송신 버퍼로부터 수신된 비트 블록으로서 상기 비트 블록을 식별하는 단계를 포함하는, 방법. The method comprises the step of identifying the block as a bit block of bits received from the transmission buffer. 상기 비트 블록을 상기 수신 버퍼에 제공하는 단계를 포함하는, 방법. The method comprises the step of providing the bit blocks in the reception buffer. 상기 제 2 디코더에 의해 디코딩된 프레임을 포함하는 비트 블록으로서 상기 비트 블록을 식별하는 단계를 포함하는, 방법. Method, comprising the step of identifying the block as a bit-bit block including the decoded frames by the second decoder. 상기 각 수신 버퍼의 시스터매틱 부분을 상위 층으로 제공하는 단계를 포함하는, 방법. The method comprising the steps of: providing a sister schematic section of each of the receiving buffer to an upper layer. 상기 수신된 프레임이 정확하게 디코딩되지 않은 경우에 정확하게 디코딩된 프레임을 수신하는 수신 버퍼에 통신가능하게 연결된 제 1 디코더에 이레이저의 표시를 제공하는 단계를 더 포함하는, 방법. The method comprises the step of providing a display of my yireyi a first decoder in the receive buffer communicatively coupled to the receive the correctly decoded frame if the received frame is not correctly decoded more. 상기 멀티플렉서에 통신가능하게 연결된 내부 인코더를 구비하는, 장치. An apparatus with an internal encoder communicatively coupled to the multiplexer. 상기 복수의 버퍼 각각은 시스터매틱 비트 및 패리티 비트를 저장하도록 구성되는, 장치. Each of the plurality of buffers is configured to store a device sister schematic bits and parity bits. 상기 복수의 인코더 각각은 상기 시스터매틱 비트를 인코딩하여 상기 패리티 비트를 제공하도록 구성되는, 장치. Each of the plurality of the encoder, the device is configured to provide the parity bits by encoding the sister schematic bits. 상기 복수의 인코더 각각은 상기 시스터매틱 비트를 블록 코드로 인코딩하도록 구성되는, 장치. Each of the plurality of the encoder apparatus, configured to encode the bit with sister schematic block code. 상기 복수의 인코더 각각은 상기 시스터매틱 비트를 리드-솔로몬 코드로 인코딩하도록 구성되는, 장치. Each of the plurality of the encoder is the sister schematic bit Reed-apparatus configured to encode a Solomon code. 상기 멀티플렉서는 상기 복수의 버퍼 각각으로부터 상기 내부 인코더로 연속적으로 비트 블록을 제공하도록 구성되는, 장치. The multiplexer is configured to provide a continuously-bit block to the inner encoder from each of the plurality of buffers. 상기 비트 블록은 상기 버퍼의 로우를 포함하는, 장치. The bit block, the apparatus comprising a row of the buffer. 상기 비트 블록을 내부 코드로 인코딩하도록 구성되는, 장치. , It is configured to encode the bit block to an internal code. 상기 인코딩될 비트 블록은 상기 멀티플렉서로부터 수신된 비트 블록을 포함 하는, 장치. The bit to be encoded block, the apparatus comprising a bit block received from the multiplexer. 복수의 디코더로서, 각각이 상기 복수의 버퍼 중의 하나의 버퍼에 통신가능하게 연결되는 상기 복수의 디코더를 구비하는, 장치. A plurality of decoders, apparatus comprising a plurality of decoders each of which is communicatively connected to one buffer of the plurality of buffers. 수신된 프레임이 정확하게 디코딩되지 않은 경우에 이레이저의 표시를 제공하도록 구성되는, 장치. Configured to provide a display of my yireyi if the received frame is not correctly decoded, the device. 상기 비트 블록을 상기 버퍼에 제공하도록 구성되는, 장치. , It is configured to provide the bit block in the buffer. 상기 버퍼에 속하는 비트 블록은 상기 제 1 디코더에 의해 디코딩된 프레임을 포함하는 비트 블록을 포함하는, 장치. Bit block belonging to the buffer, the device comprising bit blocks including the decoded frames by the first decoder. 상기 복수의 디코더 각각은 시스터매틱 부분이 복구 가능할 때 버퍼의 시스터매틱 부분을 외부 디코더에 의해 디코딩하도록 구성되는, 장치. Each of the plurality of decoder is configured to decode by a sister schematic of the buffer when the sister matic part be recovered to the external decoder, the device. 상기 복수의 버퍼 각각은 상기 시스터매틱 부분을 상위 층으로 제공하도록 구성되는, 장치. Each of the plurality of buffers is, is configured to provide the sister schematic section to an upper layer. 복수의 디코더로서, 각각이 상기 복수의 수신 버퍼 중의 하나의 수신 버퍼에 통신가능하게 연결된 상기 복수의 디코더를 구비하는, 장치. A plurality of decoders, each including a plurality of decoder communicatively coupled to the one of the reception buffer of the plurality of receive buffers, the device. 상기 복수의 송신 버퍼 각각은 시스터매틱 비트 및 패리티 비트를 저장하도록 구성되는, 장치. Each of the plurality of transmit buffers is configured to store a device sister schematic bits and parity bits. 상기 복수의 인코더 각각은 시스터매틱 비트를 인코딩하여 패리티 비트를 제공하도록 구성되는, 장치. Each of the plurality of encoders are configured to provide a parity bit to encode the sister schematic bit device. 상기 멀티플렉서는 상기 복수의 송신 버퍼 각각으로부터 상기 내부 인코더로 비트 블록을 연속적으로 제공하도록 구성되는, 장치. The multiplexer is configured to provide bit block to the inner encoder from each of the plurality of transmit buffers in a row. 상기 비트 블록은 상기 송신 버퍼의 로우를 포함하는, 장치. The bit block, the apparatus comprising a row of the transmission buffer. 상기 인코딩될 비트 블록은 상기 멀티플렉서로부터 수신된 비트 블록을 포함하는, 장치. The bit to be encoded block, the apparatus comprising a bit block received from the multiplexer. 상기 비트 블록을 상기 수신 버퍼에 제공하도록 구성되는, 장치. , It is configured to provide the bit blocks in the reception buffer. 상기 수신 버퍼에 속하는 비트 블록은 상기 제 1 디코더에 의해 디코딩되는 프레임을 포함하는 비트 블록을 포함하는, 장치. Bit block belonging to the receive buffer, the apparatus comprising a bit block containing a frame to be decoded by the first decoder. 상기 복수의 디코더 각각은 시스터매틱 부분이 복구 가능할 때 외부 디코더에 의해 상기 수신 버퍼의 시스터매틱 부분을 디코딩하도록 구성되는, 장치. Apparatus wherein each of the plurality of decoders by an external decoder, when the sister schematic partial recovery be configured to decode the sister schematic section of the receiving buffer. 상기 복수의 수신 버퍼 각각은 상기 수신 버퍼의 시스터매틱 부분을 상위 층으로 제공하도록 구성되는, 장치. Each of the plurality of receive buffers, the device is configured to provide a sister schematic section of the receiving buffer to an upper layer. FR2896359A1 (en) 2006-01-19 2007-07-20 France Telecom Method for encoding and decoding rapid and associated devices. NL9401626A (en) 1994-10-04 1996-05-01 Multihouse Automatisering Bv System for digital communication. ES2206594T3 (en) 1995-10-31 2004-05-16 Koninklijke Philips Electronics N.V. Conditional Access shifted over time. ES2225566T3 (en) 2000-06-07 2005-03-16 General Instrument Corporation Time payment system for sumionistro content to playback media systems. ES2336191T3 (en) 2000-08-11 2010-04-09 Nds Limited System and method of pre-coding of a transmitted content.